School was out one month ago. School will start back the last day of July. Where did the summer go? Add to that...........a suicide, another death, an attempted suicide, a total kitchen remodel.....with new cabinets and the works and....MORE. There is NO TELLING what else I will have to blog to you in five weeks! Ladies.....have a nice day and I will check back with you in five weeks. I've blogged before that our church has begun a ministry "outside the box" called the "GiveHIM Tennessee Ministry." This summer, every Sunday night.....instead of having services at our church, we are going out into the community and have services....whether at the park.....at the ball field....at the swimming pool.....at the bowling center, etc. We added to the ministry this summer and began feeding the children of the community on Thursdays at lunch. Some of our young men of the church got under conviction because the only meal some children receive are their breakfast and lunch at school.....so they got together and decided to at least feed them one day a week during the summer. Last Thursday was their first day and they were very pleased with the large turn out. Please continue to be in prayer for this ministry and for the men in charge of it......pray for God's blessings. Those days you feel like you just need a break from church are probably the days you most need to just go to church. Don't get me wrong..........I LOVE our church people.........but many times I am so physically and emotionally drained that I would love to take a "time out". Many times I long to be "just a member" where I can go and sit on the pew.....listen and go home. Girlfriends.................I know you KNOW what I mean. Wouldn't you love to be able to walk out of the church doors when the last amen is said....................and not wait until after "someone" gets finished talking to or meeting with your husband? Oh....and wouldn't it be nice to just once..........get to church, just as the music is starting.........instead of being the first one there???? Our lives..............first one there and last one to leave. Smile. I really wouldn't want my life any different, but it is sure nice to be able to VENT to ladies that I KNOW understand. Love you! Whewwww................I am just NOW, half-way getting order back into our home. It is times like this when I feel my age. Use to I could go and do and do and keep up with everything else. Seems as if now...............when I go and go and go.....the house and clothes suffer. Ladies.....how do you do it? I try really hard.....but eventually I have to say TIME OUT. This week is my TIME OUT. It is my week to blog, but other than that.....I refused to put anything else on the calendar. This is my CATCH UP WEEK. This has been a much needed week..............to catch up on the house work.......to catch up on the laundry.....to catch up on the garden and flower................and to catch up with quality time spent with God. During those "whewwww times" everything is rushed.....even devotions, quiet times and prayer times. This week it has been nice............getting a cup of coffee, relaxing and enjoying time spent with God. We all need a TIME OUT sometimes. These may not be the most flattering photos of me..........but they are my favorite pictures from Vacation Bible School. We are saying our blessing before eating our rocket Popsicle. Remember.........these are 2 & 3 year olds................and ...........THEY GET IT!!! I am so blessed to be able to be a part of their lives. Five weeks ago I blogged about being different. In the blog I mentioned the difference between our daughter and son. Both kids had included us in their "vacation" plans. Our son and daughter-in-law were going TENT camping, kayaking and hiking. Our daughter, son-in-law and grand-kids were going to the beach. We were very hesitant about the tent camping............at 60 years old.....been there and done that and not sure the old bones can handle much more..... BUT....Roger ordered us an old folks tent and and old folks air mattress. I am very happy to report that the weather was PERFECT for tent camping. We were under trees, so it never got very hot inside the tents. At night, it was so cool, we needed the fire. And most important........NO RAIN. That was a first for us. I'm not sure we have ever tent camped without it raining. We kayaked for two solid days.........on Dale Hollow Lake and down the Obey River. And we went on a hike on a deserted island and found a cave. It was a VERY relaxing and enjoyable few days. Next....we went to Daytona Beach in Florida. It rained every late afternoon, but the mornings were beautiful. Most of the days were partly cloudy, but that is exactly what the doctor ordered for our pale skin. Our course, our grand-kids spent the night with us while we were at the beach so we got to enjoy them and give mom and dad a break. I say all of this to say................DIFFERENT does not have to be bad. Many times different is good...................................we should keep and open mind and be willing to try the "different". Did you know salvation is a three part process? With the initial belief and profession, I am His. Justified. Professed with my mouth and believed in my heart - Savior and Lord. Adopted. In God's sight, made right. By the blood of Christ my freedom paid for. His death taking the place of my deserved punishment. I am saved. Yet, the transformation of my heart of stone to one of flesh is not complete. I still struggle and wrestle with temptation and, more often than I care to admit, succumb to it. Many times, over and over again the same sin will trip me up. I am learning daily what it means to be a "little Christ," a Christian. He is my Lord and I desperately desire to obey, to make Him proud, to glorify Him -But- like Paul writes, I do the things I don't want to do. And, the things I do want to do, I find myself not doing them. I have come a long way. I have learned a great deal. I still have a tremendous journey ahead of me. I am being made like Christ, I am in a state of sanctification. I am still being saved. Ah! But the promise I hold to, the thing I know most assuredly, that was proven by Christ's own resurrection and is my victory to claim as well - God will finish the work He has begun in me. Every promise of the Bible is mine to own, to know as truth and to live out. The day will come when I no longer have to battle my selfish, prideful, sin nature. This dark world, groaning now, will be completely new. No more war. No more pain. No more tears. It will be as He intended it to be when He created it in the first place. This place will be finally redeemed. In the new heaven and on the new earth, where the old will be completely gone and the new wholly established, I will be too. I will be finished. I will be just like Jesus. I will be just as He is. Glorified. My salvation will be done. Notice that in this three part salvation, NONE of it is up to me. I could not start the process. Jesus did that. While I was still a sinner, dead in my sin, He came and humbled Himself to die in my place. The faith to believe, the circumstances of my place and time of birth, the parents who took me to church, none of these contributing factors and more were up to me to decide. It was all a gift of His amazing grace. Once the process was initiated, God placed a piece of Himself- the third part of the Trinity, within my heart. The Holy Spirit working from within, revealing the scriptures, convicting me of my sin, teaching me the way to live, and supernaturally enabling me to do what I can not do on my own. Without His intimate and active involvement, even though I am "saved," I still cannot meet God's standard of Holiness. I NEED Him to live as I am called to live. The longer I walk with God, the closer we become, the more I know that only He can rectify all that has gone wrong with His creation. I see and experience how He keeps His word and, as a result, that Jesus alone, when He returns, can fully banish Satan from this realm. When that happens, every knee will in FACT bow and every tongue WILL confess that HE is Savior and Lord. What a day that will be! I am saved. I am being saved. I will be completely saved - but none of it, my life with all it's trials, is about me, the one being rescued. My life and, more importantly, my salvation, this three part process, is all about the ONE who is doing the saving. Why did I write all this out here, in this forum for ministers' wives? Ladies! Too many of us don't understand this. We are striving to achieve a salvation on our own by serving and doing. Too many of our church members view their faith as a series of check lists of things they can and cannot, should and shouldn't do. My heart is to teach and encourage Christians to know these things and to live them. Let's stop striving for our salvation and start resting in it . . .
A local minister's wife died unexpectedly this past weekend. As I read of her passing, my heart broke and rejoiced in the same beat. Her death won't be reported in the local paper outside of the obituary page, yet her life is being heralded all over Facebook. Susan was my oldest daughter's 3rd grade teacher. But I met her a long time before Riley turned 8. She was the wife of the Minister of Education at FBC Clarksville when we first met. She was plugged in as a leader in the student ministry, teaching Sunday school and chaperoning whatever youth trip was on the calendar. Susan and Steve's only daughter was -and continues to be- a credit to them both. Even though Jennifer was raised in the preverbal "fish bowl" of the church, she grew under their guidance in grace and truth. By God's grace she broke the mold of the stereotypical "preacher's kid" in all the best ways. The Griffiths followed God's call to serve a church in a neighboring county. Susan was all in at their new ministry position, again faithfully working with and discipling teens and young adults at her husband's side. Yet she still didn't feel released from her teaching job in the local public school system here in Clarksville. That was a ministry of hers too. Whether Susan was openly teaching God's word within the halls of a church building or faithfully loving the students, faculty and staff of her elementary school she did it all unapologetically with Christ's grace. Susan was quick to give God all the glory for growing her faith and allowing her to live her life the way Jesus intended, abundantly. You see, Susan, somewhere in the middle of parenting and, eventually grand-parenting, she never lost her sense of humor or zeal for trying something new. All this was not is spite of the obstacles God allowed in her life, but was done in and through them. In writing this, I would do her testimony a disservice if I failed to tell you how she allowed God to carry her through more than one, years' long bought with cancer. Yet, I am sure she would tell you her biggest trial, the circumstances that have kept her clinging to the hope of the cross, was the sudden passing of her beloved Steve. When he died suddenly one average Wednesday night after leading his regular Bible study, she lived her faith transparently, openly sharing her loneliness yet praising His faithfulness each day of the nearly 5 years that creeped by since then. Susan continued to live and to love, embracing her students, her friends, and her family. A beautiful granddaughter was welcomed and adored. Her grandson continue to grow and to be delighted in. Vacations were taken, parties were held, holidays were celebrated all through her identity as God's beloved child. We all hurt for Jennifer, her husband, and their two littles, who will probably only remember their adoring grandmother through the memories of others. We all long for one more of her hugs. We all wish we could hear her infectious laugh once more. Every student that sat in her classroom, every teenager who confided in her heart, and countless others who were blessed to know her at any level, rejoiced that this weekend when she was reunited with Steve, completely healed of her cancer and finally with her Savior. Yes, Susan was an excellent wife of a minster. She was a talented school teacher. She was a loyal, fierce friend. She was a mother, mother-in-love, and a grandmother. Yet, I don't think Susan would have defined herself by any of these hats she wore. She was -and now, more than ever, still is- God's. And there remains a countless number of us that will be forever changed and touched by her legacy. I came across a verse from Psalms recently and it instantly spoke straight to my heart. I don't remember the context of how or why this verse caught my attention, but it was like the Holy Spirit said, "Pay attention. You need this." 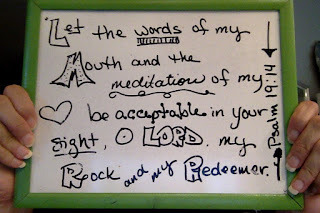 "Let the words of my mouth and the meditations of my heart be acceptable in your sight, Oh LORD, my Rock and my Redeemer." The verse was convicting and encouraging all at the same time. It transcended my circumstances, whether at home, church or work -yet, was so personal. God showed me that my tongue was quickly getting out of control and that I was allowing my thoughts to slip my emotional state into a dark place. 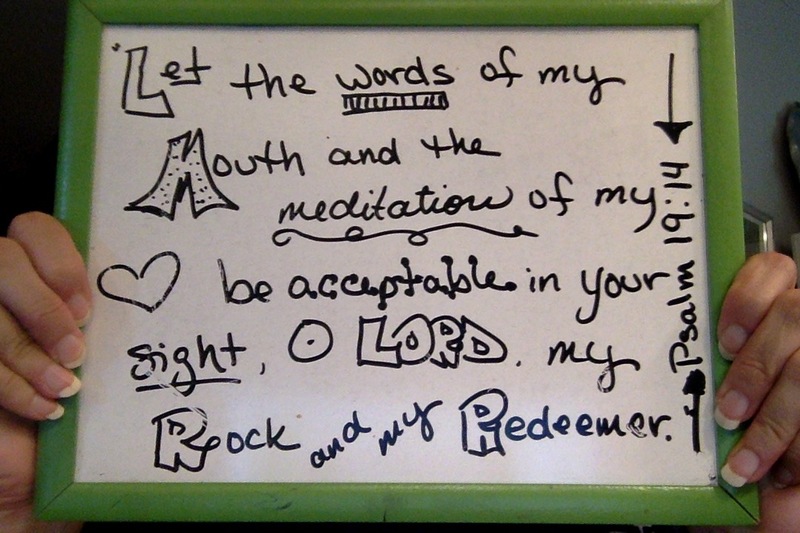 I needed both my words and my meditations to be acceptable in His sight. They both needed to be redeemed. They needed to be made right. Part of me, a big part of me, wants to argue with God about this. My words could be worse. My feelings are completely justifiable. Anyone in my situation would feel the way that I feel. My circumstances are often frustrating and infuriating. I can play the comparison game all day and make myself seem pretty good. Ah, but pretty good isn't good enough, by His standards. To be acceptable in His sight, they need to be edifying of others and glorifying of Him. As my Lord, He has the right to ask this of me - no matter how impossible it may seem. So, you can see the convicting part of this verse. The Holy Spirit is saying that my words and meditations need to be better; they need to be acceptable in my Lord's highest, most perfect opinion. As a result, when I found my words lacking and my meditations darkening, I began to practice memorizing this verse. Then the coolest thing happened. My meditation was on God's word and this very verse that had convicted me began to encourage me. "My Rock" already knows my circumstances. He has seen the injustices. He is the stability in the midst of all my uncertainty. "My Redeemer" has already saved me, justifying me forever -sometimes in spite of the words of my mouth and the meditations of my heart. He knows those sinful tendencies of mine and He is still at work on me, continuing to redeem my unruly tongue and selfish, old-nature. Besides, the entire verse isn't even a command. God is not directly telling the reader to get her act in order. The writer is praying! He is asking God to help him do what he cannot do on his own. This prayer acknowledges God's authority as Lord and confesses that the words of the mouth and the meditations of the heart fall short from His holy requirements. It also claims the promises God has made us to be our Rock and our Redeemer. The truths of this one verse did not fall on me all at once. And, I am far from an expert at applying it to my life yet. But I have found it to be true. As I meditate on what I know would be acceptable in His sight, my words soften to those around me and my heart is lifted, not feeling bogged down by the stresses of the day. As I do what God directs, He keeps His word, fulfilling His roles as my Rock and my Redeemer. My circumstances have not really changed. The challenges may in fact be even bigger and harder. My words and meditations are still all too often very sinful and destructive but for now, at least, when the Holy Spirit gently points out these very real faults, I am responding with this prayer. It also just so happens to be the fourteenth verse of the nineteenth chapter of Psalms. The hard truth about ministry is that none of us is immune from the schemes of the enemy. I must not be Little Miss Much-Afraid of the enemy...but I must be diligent. Perhaps you read about Lysa Terkeurst pursuing divorce from her husband of ‘almost 25 years’. I hesitate writing about this because my inclination is typically to not talk about people…but since she has addressed it publicly...God can use it to help all of us in ministry. Lysa is president of Proverbs 31 ministry. Maybe you have heard her voice on KLOVE during one of her ‘1 minute of encouragement’ spots or read one of her many best-selling books or possibly you even were at Union University a few months ago and heard her speak in person. Did you know as you were listening to her on the radio or reading her blog or newest book or hearing her speak at Union that she was in such a struggle? Was it obvious or was she, like so many of us, able to cover up her broken heart like a cast over a broken bone and just go on? Many feelings might come when you hear of any woman in ministry experiencing the end of a marriage. Surprise. Anger. Compassion. Heartbreak. Shock. Empathy. Confusion. Questions like how? Why? What? Thoughts from complete understanding to wide-ranging judgment flood our minds. Frankly, my purpose in bringing it up is to remind us that none of us is immune to the schemes of satan, our enemy. he (I just cannot capitalize his name…even when it breaks grammar rules) wants to destroy Christian marriages. he wants us to think that the man (or woman) at church or at our job or a workman at home or an old boyfriend (or girlfriend) on Facebook or Instagram or WHOEVER happens to be attentive to us and pays attention to us is harmless. he wants us to believe that that man (woman) cares more about us than our husbands (wives) do and then he desires for us to succumb to our yearnings and his seductions. he wants us to become dissatisfied with what we have and think that the weedy grass on the other side of the fence has to be better than the dry, brown grass we currently live in. Or maybe....just maybe the mistress isn't a woman but the church. ouch. or sports. or working out. or a hobby. What! You think that couldn’t happen to you? Yes it can! Be afraid of thinking you could never do that. Be afraid of thinking he could never do that. Remember Peter? He said he’d never deny Jesus….and he did. Wait! Perhaps it already has happened to you. If so, you are not alone. Sadly, it has happened to lots and lots of people in ministry and your pain is unbearable at times. The great news is that our confession brings glory to God and is a form of worship (See Joshua 7:19) and he (she) who has been forgiven much, loves much!! You, my friend, understand God's mercy and grace like many do not. Father, I pray for all of us in ministry to be diligent against the schemes of the enemy. Use our failures to bring much Glory to Your name. Give us wisdom to know if and when to bring that what is hidden out in to the Light and may the exposure bring healing and hope. Wrap those who are hurting from broken or struggling marriages in Truth and give them Your Power to heal. In Jesus' name....amen. In case you don’t already know this about me, I am like little miss “Much-Afraid” from Hinds Feet on High Places by Hannah Hurnard. If you have not already read this book (or if it has been a long time), run, don’t walk to your nearest library or book store and get it!! Or click/drag/touch to your nearest App or Amazon site and get it! Either way, acquire it and read it!! It is a beautiful allegory depicting Much-Afraid as she travels with her two companions Sorrow and Suffering and battles her fears while traveling to new heights of love and power and victory!! Driving over tall bridges. A few years ago I was about to leave Carol’s house in Dallas to drive home trying to figure out how to miss the very, very tall bridge to get to the interstate I needed to get on. She said, “Dana! You went to Africa all by yourself you can drive over that bridge! !” Truth. She spoke truth! High diving boards! Oh the child in me still remembers standing on that high dive at McCree park pool while the 100’s of people shouted for me to jump!! Shivers still now! Being the first one let off at home when in a car of my Jr. High friends. After all, what will they say about me when I’m not there? Speaking in front of people. Crazy since I do this all of the time. I still get diarrhea. Going out in public and seeing certain people. Won’t mention any names. I am not afraid of all of these all of the time and, believe me, this is not a complete list….but it is what crossed my mind and/or am going through right now. Interestingly enough it is thundering and lightning right now and I am not afraid of that! Or of spiders or of dying or of the dark. I am afraid to drive on Interstates. There. I said it again. I mentioned it in the list above but I feel like I need to say it again. expound. confess. admit. it's a burden. I honestly feel like I have written this multiple times in one of my blog posts over the last year or two because it has become so problematic and difficult and such an issue with me….but I cannot find any record of it….so I suppose I have written it on the portals of my heart and my mind rather than my computer. This fear is so odd because…. I learned to drive in Dallas. Not a lot of country roads there. I have driven from Texas to Tennessee. From California to Indiana. From many heres to many theres on many Interstates multiple times. And all of a sudden….I am afraid to drive on Interstates!! And this is a problem. It’s a problem for many reasons but it’s a problem especially because I do a lot of traveling to speak. For years I’d love to pack up my car and hit the road with praise music blaring and worshiping and preparing my heart and mind to share what it is God has put on my heart to share. A sweet time with me and God. For the past two years or so I still pack up my car and hit the road with praise music blaring and worshiping and preparing my heart and mind to share what it is God has put on my heart to share but I have to do it taking back roads and feeling so frustrated and guilty and sad that I am afraid to drive on the Interstate. Why? What is wrong with me? What can I do about it? Many times I am speaking on Power and Strength and here I am powerless and weak and unable to do such a seemingly impossible thing. There have been a few times I got on the Interstate for a few miles and ‘did it afraid’. Some call it "exposure therapy". Oh the victory! There have been many, many times I gave in to my fear. Oh the defeat. I know that this is something that must be conquered because I know women who do not drive at all. Did they start out not driving on interstates and then it escalated to not driving on busy streets to not driving out of town to not driving anywhere? The ugly spiral I see ahead of me scares me. I see myself making decisions about visiting family or taking children places based on whether or not I have to drive on an Interstate!! My decisions MUST be based on what God wants NOT on what I can or cannot do. Why am I sharing this? I am not sure. I hate to even admit such a thing. But what I am sure about is if you have any advice, help, or thoughts...let me know!! AND that if there is something you are fearful of….do it afraid! I cannot wait until I can write to say I am no longer afraid to drive on Interstates!! I attended three funerals in the last three weeks. I lost a great aunt. A beloved church member passed away. A dear member of our church buried an aunt who was like a parent. Three funerals in a relatively short period of time. We hear this cliché all the time: life is short, live it to the fullest. None of us knows when the Lord will call us home to be with Him. Death is an unavoidable reality, but for those of us who know Christ Jesus as Savior, we know and firmly believe that death is not the end. We believe the apostle Paul when he said, “To live is Christ and to die is gain.” (Philippians 1:21) Also, “To be absent from the body [is to be] home with the Lord.” (2 Corinthians 5:8) I believe that of each of the three who were laid to rest, all had a personal relationship with the Lord Jesus Christ! The funeral services were more like “home going” celebrations. As I thought about the brevity of life and all of the pain and the trials that come with our time here on earth, I began to wonder: Why do we complain so much? I say “we” because I am so guilty!! What if we determined to live each day thanking the Lord for His grace and His mercy, and ALL of His goodness towards us, instead of focusing on what’s wrong and what we don’t have? Spouses: They are not perfect, but neither are we. Accept them, flaws and all…..God accepts us flaws and all!! Families: Be thankful that God gave you a family, people whom you can love and they, in turn, can love you back! No family is perfect; we all have dysfunctionality of some kind. That’s why we need a Savior! Churches: Sometimes we spend a lot of time zooming in on what’s wrong with the church instead of what’s right. Just as spouses are not perfect, neither are our churches, which are made up of imperfect people who have issues just like us. If you belong to a church that is teaching the truth of God’s Word, encouraging the members to live it out, and striving to reach the unsaved with the Gospel, be thankful! Let’s pray for the church to be strong in the areas where it is weak. Pray, don’t pout! Nation: All of us can find a lot of things wrong with our nation and many of our elected officials. Government was created by God (Romans 13: 1-7), yet unfortunately mankind has corrupted it. We are commanded to pray for those who are in authority over us (1 Timothy 2:1-2); the situations may not change, but our attitudes surely will! I could list many more things that we find ourselves complaining about. Again, we absolutely cannot change people or situations (only God has the power), but we CAN change our attitudes toward people and situations! When that strong urge hits us to dwell on the negative, let's think on all the wonderful, beautiful, positive things that the Lord has put in our lives. God has been so faithful, and we see new mercies every day! (Lamentations 3:22-23). Remember, life is short; may we live it to the fullest for God’s glory! So………..